← “The Light at the End” early release! On New Year’s Eve, 1930, the Doctor lets Charley keep her appointment at the Raffles Hotel in Singapore. But his unease at what he’s done to time by saving her life soon turns into fear. Sebastian Grayle: immortal, obsessed, ruthless, has come to the city to meet the Time Lord. To the Doctor, he’s a complete stranger, but to Grayle, the Doctor is an old enemy. An enemy that, many years ago, he finally succeeded in killing. And this is his only chance to gloat. The Doctor and Charley desperately search human history for the secret of Grayle’s power and immortality. Their quest takes in four different time periods, the Hellfire Club, the court of Edward the Confessor and the time vortex itself. And when the monsters arrive, the stakes are raised from the life of one Time Lord to the existence of all humanity. 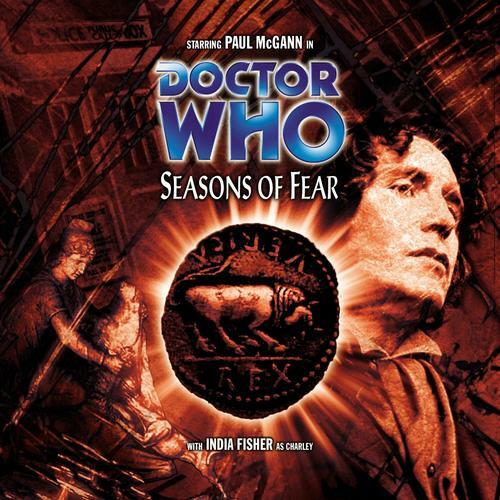 Paul McGann is the Doctor in Seasons of Fear. What’s so special about these serials is that they don’t take place in the same location throughout their runtime. Both serials see the Doctor and his companions chasing or being chased through time and space across several unique places, such as the Mary Celeste or the planet of Mechanus. Seasons of Fear follows along those lines. Through four episodes, the Doctor and Charley visit four distinct locations in their quest to stop an immortal human from handing Earth over to his alien masters. Jumping throughout history, Paul McGann and India Fisher, along with Stephen Perring as the villain, are accompanied by a solid story, a great script, several unique supporting characters, and the return of a familiar, yet infamous Who villain from years gone past! The Doctor has finally brought Charley to her long-delayed rendezvous with Alexander Grayle in Singapore, on New Year’s Eve as 1930 rolls into 1931. 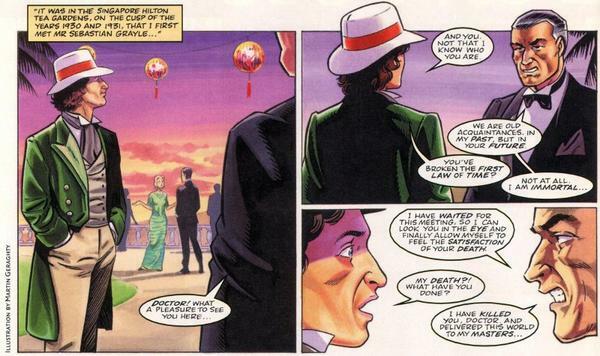 As the Doctor sits in the tea garden, enjoying the view, he’s approached by an older gentlemen; Alexander’s grandfather, Sebastian Grayle, who says that this is the moment he has been waiting for; a chance to gloat at his long-time opponent, a Time Lord he has already killed at the behest of the masters who now rule the cosmos. But the Doctor has never met him until now. The script also allows for a wide breadth of secondary characters as the Doctor and Charley romp through history. We meet a Roman soldier and a high priest, an English royal and his scheming wife, and a father and daughter pair straight out of Jane Austen. Cornell and Symcox give each character just enough of background and dialogue to render their importance and then let the plot take its course. There’s a nice touch where the Doctor, even in a broken timeline, runs into someone he knows, and who knows him, but unlike Grayle, doesn’t want to kill him…but subject him to a far worse fate. Grayle’s masters are revealed at the end of the third act. I admit, when they were revealed, I paused the play, went back, listened to it again, went ‘nah, couldn’t be,’ hit up Wikipedia…and yep. Cornell and Symcox bring back a much maligned villain from the old run and make them the bad guys here. Weirdly, because we can’t see them (and the horrible costumes), they actually work BETTER as bad guys. But the focus isn’t on the masters. It’s on Sebastian Grayle. Stephen Perring plays the immortal human across four eras; as a victorious conqueror, as a high priest denouncing his faith, as a bishop embracing his masters as Angels of the Lord, and as a cocky socialite who’s moment of triumph is incredibly near. Really, Perring is playing four different parts in Seasons of Fear, and he does so magnificently. The confusion of “who is this man troubling me” meets “will no one rid me of this troublesome Doctor” meets “I will get rid of him” meets “I have gotten rid of you, in the future, and this is my moment!” Perring refuses to ham it up, and instead of chewing the scenery, he establishes himself as a worthy adversary to the Doctor; one who’s patient, growing in power, and immortal. Unstoppable. So when the Doctor realizes that he wants to hurt Grayle, it’s a moment that McGann really nails. McGann’s Doctor is still the hyperactive, non-stop, “let’s get a move on” Doctor from previous audios, and at first, it’s his curiosity, not Grayle’s thirst for revenge, that motivates him. As the serial progresses, and the Doctor realizes the laws of time don’t apply, he begins to worry about his own thirst for vengeance against Grayle. He never hits the “my God, what have I done” moment, and the serial manages to remain lighthearted throughout its runtime. But, as we all know that the Eighth Doctor quite possibly ends the Time War in the worst possible way, a way so horrible we can’t even imagine it, it’s interesting that we might be seeing the proverbial seeds of his despair planted here in this serial. On the positive side, we see the Doctor in “Doctor” mode as he deduces the location of the masters, quick-thinking and manic even as Charley tries to keep up with his thought process. Coming off of her performance in The Chimes of Midnight, India Fisher spends part of this serial wondering if it’s HER existence that allowed Grayle’s master to succeed. It’s a nice piece of continuity, once that’s laid out, but not smashed over the listener’s heads. Charley is still her cheerful self in this audio, refusing to get beaten down and always with a quick word or witty comment. When the situation is dire in the fourth episode, however, the kidding around stops. Charley really has come into own as an independent companion and not one who’s entire purpose is to “ask questions, receive exposition,” and this serial continues that trend. Jumping across historical periods, Gary Russell and the sound crew establish each one; a Roman camp, a Saxon castle, a English social scene, and the final scene itself in the time vortex. The clash of arms, the sound of a banquet, the echoes of a cavern, are all presented in fine form. And eats you when you’re sleeping. Next up – The Doctor and Charley travel to the remote Cimmerian System to unravel the mystery of its sun. But darkness has already embraced the scientific base on Cimmeria IV in more ways than one..
Paul McGann is the Doctor in…Embrace the Darkness.